Grocery delivery service seems to be the hot new thing. For the longest time, the only one I knew of was Peapod, which works with the Giant stores here. Then Amazon unveiled their Fresh program and Walmart followed up with their pick up service. I’ve never really minded grocery shopping. I’m incredibly picky about my produce and know which times to go to the stores to avoid the crowd. I also love exploring the International Foods aisle to see what new-to-me things are out there. I debated on using a service for a while. First, do I really want to pay for someone to deliver my groceries when I’m completely capable of going to the store and picking them out on my own? Second, do I trust someone to pick them for me? I finally decided to try it out last weekend. Friday and Saturday we were supposed to have really bad storms and I will admit, grocery shopping in the rain is less than ideal. I checked out all of my options to see what would work best. 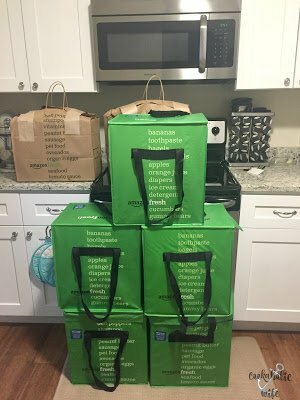 Walmart – I’d still need to lug the groceries in the house in the rain and that was the main thing I wanted to avoid, so they were out. Peapod – I price shopped between Peapod and Amazon and they were pretty comparable on most things, however in my area, they were out of 3-4 things that I needed so I decided it wasn’t a good fit for this try-out. Amazon was the winner, because of what they had to offer, the 30 day free trial and the fact that you get $25 off your first order of $100 or more. Disclaimer: These opinions are solely my own. Amazon Fresh has no idea that I am leaving a review of their service and I have not received anything from them for the purpose of this review. Ordering: You sign up for the Fresh trial and then can begin adding things to your cart. It did take me a while to do this because I read nutritional labels so I had to open and enlarge multiple items to see what the best choice was. I did have a hiccup during my order; I’m not sure if the internet went out for a few minutes or what, but it told me nothing else could be added to my cart. I hopped on my phone to continue and then there were 12 packages of toilet paper and 7 packages of turkey bacon. Once I got those and the additional items that it had doubled during the glitch removed, it was pretty easy. Delivery: You can choose what time you would like to have your groceries delivered and if you want to be there to accept the delivery or not. I was ordering at 8 pm on a Thursday and my options were morning deliveries for Friday, Saturday and Sunday. I chose an unsigned delivery on Saturday morning between 6-8 am. They arrived at 7:33 am. I don’t have a covered porch so the bags were left on the front step. Since it had rained all last night the bottoms of them were damp and I had to wipe down my floors again after unloading, but this really isn’t their fault, just a minor inconvenience if you choose grocery service to avoid rain and don’t have a covered, dry area for them to place them. Packaging: Wow that’s a lot of packages. I received 5 of their totes and two large paper bags for $100 worth of groceries. I use plastic bags at the grocery store because I reuse them as trash bags for the trash cans in the house and also to scoop out cat litter daily. I think it would have amounted to about the same. 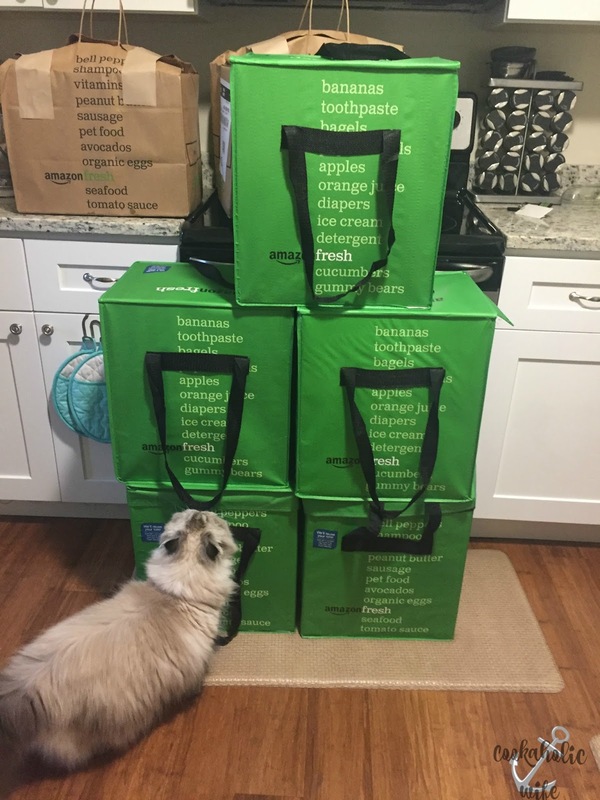 Each of their green totes has a layer of padding in it, followed by a paper bag with handles and then there are frozen gel packs on the top and bottom with your groceries layered in between. They did a really good job of filling them up with like items and not smashing anything. I did have one tote with only a thin package of prosciutto in it, which was strange. Environment: There is a lot more I could do to be environmentally friendly, but we do at least recycle. This order came with a lot of items to be recycled. All 7 of the paper bags and a plastic sleeve wrapped around each produce item. Each tote comes with at least 6 frozen gel packs in it, which I fully understand wanting to make sure the items are cold, but this was excessive to me. I kept 4 and had to throw out the rest because I simply don’t have anywhere else to keep them. Quality: This was the real category I was worried about. What would the quality of the produce be like? The carrots, lettuce, deli meats, cheeses, ground beef, dry goods, etc. were all perfectly fine. The strawberries were definitely past their sell date. They aren’t moldy, but they’re mushy. The mushrooms may survive a day or two in the fridge, but likely not more than that. Both of my apples were bruised. Storage: To me, this is the biggest failure. You keep the totes until your next delivery and then they pick them up. The problem is that you also need to keep the padding in them. I removed it from 3 of the 5 totes and shoved it all into the other two. The three empty ones I was able to fold up like a reuseable grocery tote and shove them in an empty cabinet. The other two are currently hanging out in my dining room overflowing with the filling. If you lived in a small space or don’t have a coat closet, like we don’t, good luck finding somewhere to keep these. If anything, you’ll have a mountain of cat face-scratching blocks or something for your kids to play with. Cost: I eat a lot of produce. 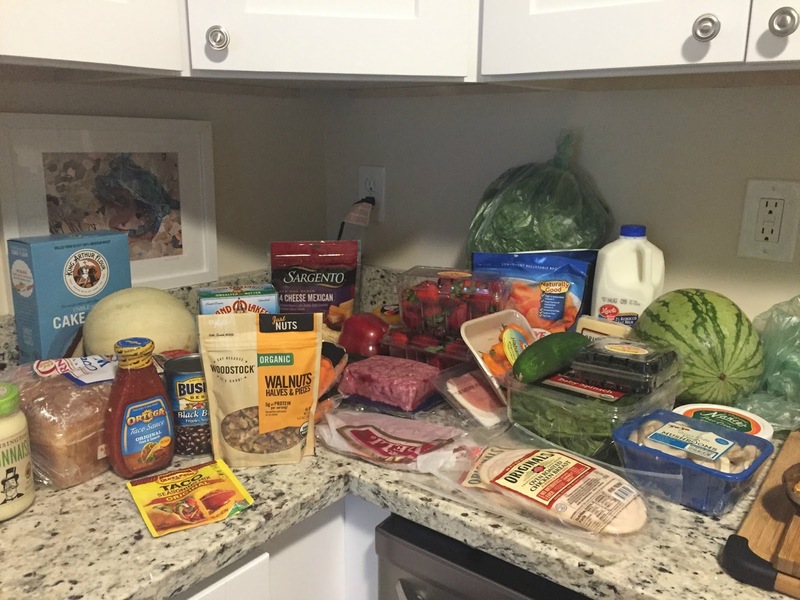 I would say it’s 60% of our grocery bill each month. Meats make up 20% and then the rest is dry goods, paper products and cat litter. From the list above, you’ll see there were minimal meats and dry goods and no cat litter. As disgusting as it is for two people, I typically spend $125-160 a week. The prices were pretty average to what I pay at Wegman’s. There were a couple items that were more expensive but then quite a few cheaper so I think it evened out in the end. Before the $25 off $100 coupon, my order was $133 and it came to just under $108 with tax. If you order more than $40 worth of products, you don’t pay a delivery fee. I’ll use the service again, especially since we have the free trial, but I’m not sure if its worth it to keep it long term. I think I’d rather go grocery shopping. I am going to try out using Peapod and Walmart’s pick up service at some point and see how they work out for us. If you desperately need groceries and can’t get to the store, I’d highly recommend it to anyone. However, if you are just doing it to be lazy and avoid going to the store and are picky about your food, maybe it’s better for you to keep shopping yourself.